Our busy schedules sometimes get in the way of our body care routine. We don’t make time for that well-deserved massage or spa session because of our day to day worries. But this should not be so! Even amidst a stressful and hectic schedule, we should always find time to take care of our body. Whether it’s for a spa manicure and pedicure session or a well-deserved massage, you definitely deserve pampering that will soothe away your tiredness and help you welcome the week ahead with confidence. Elite Nails offers a wide variety of services that can address your hand, feet, and body spa needs. And, we don’t stop at pampering you! We also want to offer you rewards for your loyalty and support through our Loyalty Card. Treat yourself to a day at the spa and avail of the services offered at Elite. 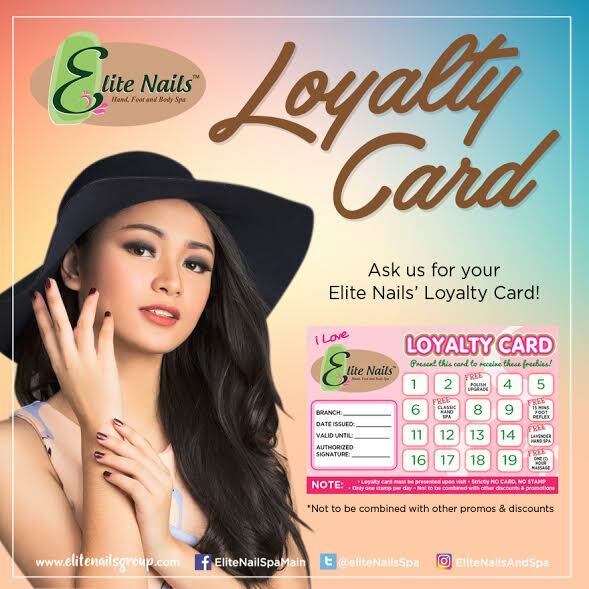 When you visit Elite Nails and avail of our services, you will receive a Loyalty Card that you can use on your next visits to earn points. Accumulation of points will entitle you to cool freebies and offers. What are you waiting for? Get rewarded while getting pampered with Elite’s Loyalty Card. At the end of a long work day, have you ever found yourself experiencing back pains or neck stiffness? Are you so caught up in the hustle and bustle of life that you have no energy and enthusiasm for anything else at the end of the day? Or do you simply need a day of pure relaxation and pampering? If your answer is yes to one of these question (or all three! 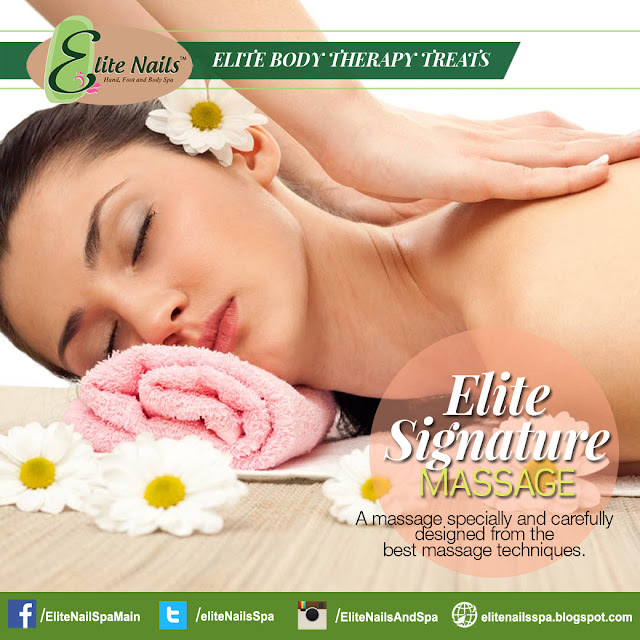 ), then you definitely need to visit us at Elite Nails & Spa to try our signature massage. It’s almost impossible not to suffer from anxiety or stress in life. Not only do we get physically tired from the demands of our work and other aspects of our life, oftentimes we get emotionally drained too. A massage can promote deeper and easier breathing and help relieve headache. Aside from helping you relax, massages are proven to be extremely beneficial. A good massage can help reduce stress level, which is essential in achieving a healthy lifestyle. It has also many positive effects on your health including improving circulation, lowering blood pressure, relaxing muscles, and strengthening the immune system. On top of all these, massage helps improve posture and flexibility. Here at Elite, we offer you the best massage experience. Our Signature Massage is specially and carefully designed from the best massage techniques. We guarantee a pampering and relaxation experience like no other. Recharge your energy now and be ready for more exciting adventures with Elite Signature Massage! Hardworking hands need some well-deserved pampering. And what better place to pamper your tired hands than in Elite Nails & Spa! Regular manicures can enhance the health of your fingernails and can help maintain well-moisturized cuticle. In addition, getting a regular manicure will help prevent any nail disease or disorder. Aside from avoiding unsightly hands and nails, a manicure will clean and shape your nails and treat your cuticles, which is important in maintaining the health and strength of your nails. Manicures usually culminate with nail polish application where you get to enjoy choosing from a range of nail polish colors and style. With our Elite Spa Manicure, you can now stop worrying about chipped nail polish only a few days after application. Here at Elite, we only carry imported and branded nail polish, which ensures that you get to enjoy perfectly polished nails for a longer period. We aim to give our customers only the best so cheap and dull polish are a big no-no to us! Make the most of your mani experience by choosing a nail polish that best reflects your personality and style. Schedule your next mani session at Elite now and we’ll give you the absolute pampering and beautiful hands that you deserve! The Christmas season is fast approaching! Here starts the endless gift shopping, joyous parties and reunions, and growing to-do list before the much awaited holiday arrives. Even with our busy schedules, there is one thing we should absolutely not forget—some much needed me-time. Elite Nails & Spa brings you an early Christmas treat with its Merry Holiday Packages. Amidst all the holiday preparations, make sure you find time to keep up with your beauty regimen. Starting from only P650, you can experience a fabulous beauty session in any Elite branch to help you relax and de-stress. You can choose from an array of packages specially designed to suit your beauty needs this holiday season. Sooth tired feet and hands from all those shopping and parties with our manicure and pedicure packages. Be the belle of the ball by displaying your holiday glow with the help of our whitening facial and body scrub packages. And of course, give yourself some much needed relaxation by getting a massage to conclude your beauty session. Remember that the Christmas season is no excuse to look shabby and haggard. Don’t just be merry; make sure you are pretty and ready for whatever surprises await you this holidays. Visit the Elite Nails & Spa branch near you and have not only a merry but also pretty Christmas!